A FACEBOOK group has been formed for BBB graziers and non-grazing land managers who work in the Bowen, Broken, Bogie (BBB) catchment near Bowen and Collinsville. It’s called BBB Community – Events & Info Hub. It highlights upcoming events taking place as part of NQ Dry Tropics’ Landholders Driving Change (LDC) project, which aims to tackle erosion and improve land management, productivity and water quality in the Burdekin region. All events can be found in the latest edition of The Grit magazine the LDC’s monthly online newsletter. 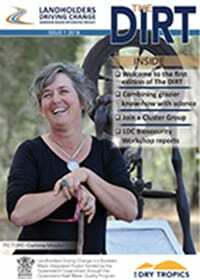 All editions of The Grit can be found at the Landholders Driving Change website. The group complements the Grit, Dirt, flyers and emails already distributed to the BBB community, by providing an additional communication channel to promote LDC events and activities.